The Avalanches made their long awaited comeback earlier this year, releasing their album Wildflower some 16 years after their 2000 debut. The album featured a heavy hip-hop influence and featured appearances from Danny Brown and MF Doom among others. 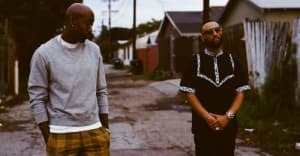 Today, December 30, the Australian act has shared an off-cut from the record featuring Freddie Gibbs. A message on the song's Soundcloud page describes it as, "a Christmas jam for you all." Check out the Indiana spitter going in on "Bad Day" below.